Often, in the world of creativity, different imaginative mediums serve to influence each other. Pablo Picasso’s work heavily influenced architecture through his principles in Cubism, especially in the Czech Republic. Buildings like the Hodek Apartment House reconcile Picasso’s revolutionary findings of art with architecture and local tradition. Similarly, artists like Marina Ambramoviç and Ulay combine experimental concepts with artistic performance and body art. Even here, in our very own artistic space, Poetry has wandered into visual artistry (if you recall our whitespec show in the summer months, Pathways, by Nicole Livieratos — Livieratos utilizied words of poetry in her installation). Among these few examples, Mimi Hart Silver’s work is no less of an important notch in the belt of influenced and combined art forms. 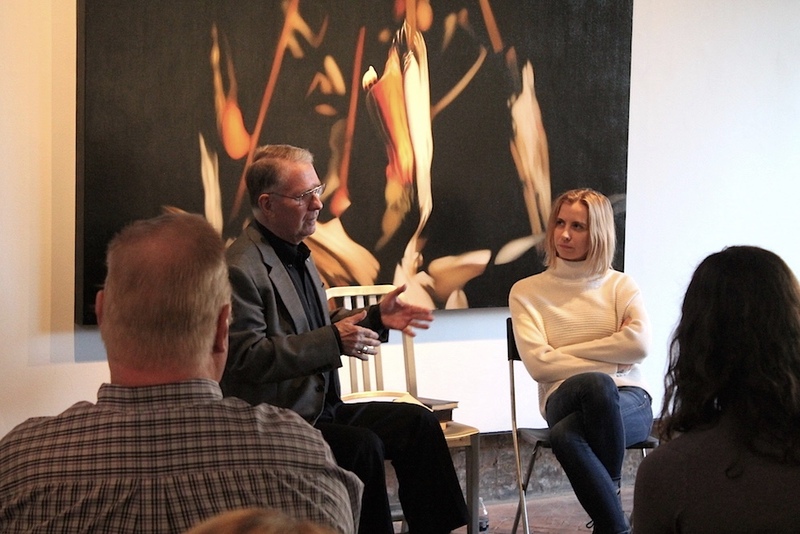 During our Saturday Salon two weeks ago, many Atlanta locals gathered together to understand and discuss the influences of William Faulkner’s work on Silver’s exhibition. Lead by Faulkner scholar Tom McHaney, the talk covered topics from Faulkner’s life, his writing of The Bear as well as Silver’s own attraction to the famous author’s words. In Territories/Kingdoms, Silver examines her roots as a Southerner, presenting 2D work across multiple mediums, all in conversation. Paper has been manipulated to resemble hide or skin. These fragments are patched together to convey an illusion of an aerial standpoint, geographic landscape and crude map-like visuals. Paired with classically rendered abstract oil paintings detailing blurred images of a bird hunt, the result is an eerie and haunting portrayal of biological and hierarchical divisions. As discussed during the Salon, Faulkner’s attention to that of the primitive, the raw, the survivor, are all notions brought up in the viewing of Silver’s works. McHaney brought images of drawings created by Faulkner in his early days. Providing insight into Faulkner’s writing by reading an excerpt from the text of The Bear, McHaney enchanted the crowd with the lore-like style of Faulkner’s distinct prose. Posing questions to Silver about the nature of her work, a discussion of themes (common between Silver and Faulkner), relating to the rough characterization of Southern indifference, were addressed. The attention to the South: as a place of deep-rooted tradition, a place charged with violence in the animal hunt and in ways of life, and a place where the nature of human instinct in terms of trauma comes to fruition, provided insights into human tragedy as a coping mechanism. Silver’s articulation of Faulkner as a key influence in her work through his reverence for the wild, the untamable, the deepest animalistic drives, was key in achieving a deeper understanding of Silver’s work. 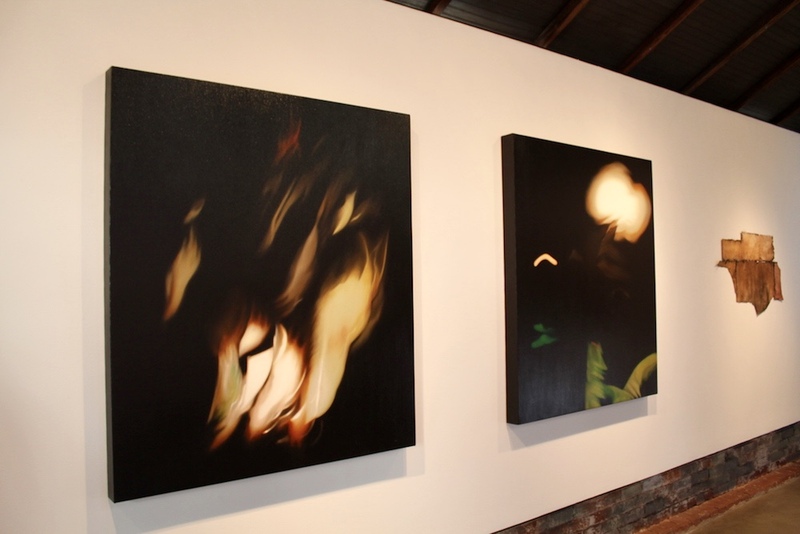 McHaney’s insights to Silver’s explanations not only illuminated the works being shown at whitespace, but also provided a closer look at trauma and memory. Silver’s images of wings, legs, breasts and animalistic body part roped together in the aftermath of carnage and the permeation of violence, were augmented by a discovery of Faulkner’s work as an articulation on survival in the wild. The discussion of both Faulkner and Silver’s interests in the continuum of life and death, charged the gallery space with curiosity as all participants stepped into the search for meaning in human tragedy for a brief time, together. This entry was posted in Artist talk, Atlanta, Painting on February 12, 2016 by blog814.